One Owner!! 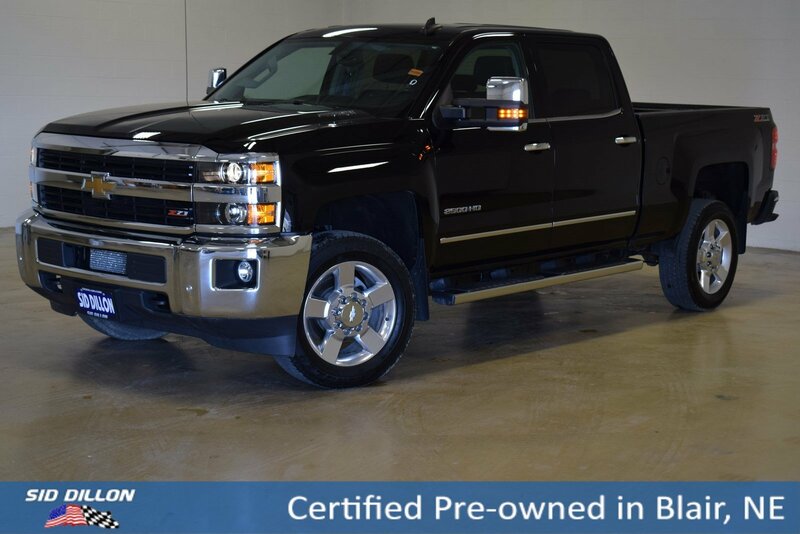 This Chevrolet Silverado 2500HD has a strong Turbocharged Diesel V8 6.6L/403 engine and was bought here at Sid Dillon - Blair. 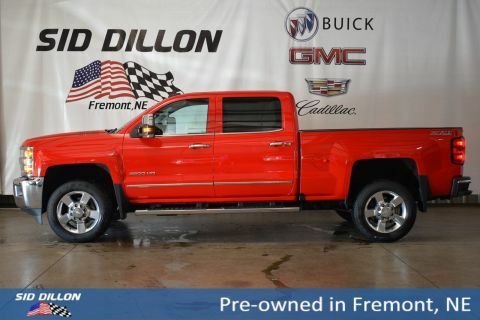 Z71 PACKAGE, OFF-ROAD includes Leather/Heated seats, Running boards, Power drivers seat, twin tube Rancho brand shocks, (JHD) Hill Descent Control, (NZZ) underbody shields. 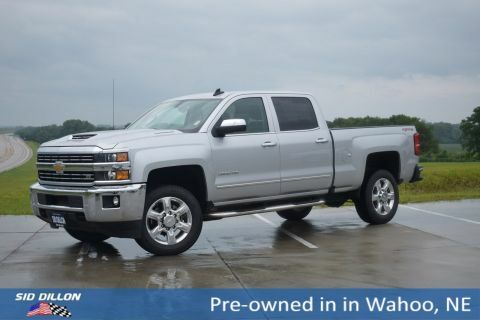 Also includes brushed metal Z71 door sill plate, unique Z71 gauge cluster, unique finish interior trim plates, unique lower bumper appearance, unique grille design with Z71 badge and Z71 pickup box decals, WIRELESS CHARGING, WHEELS, 20 5-SPOKE POLISHED ALUMINUM. SNOW PLOW PREP PACKAGE includes power feed for backup and roof emergency light, (KW5) 220-amp alternator with gas or diesel engine, forward lamp wiring harness, (TRW) provision for cab roof mounted lamp/beacon, (NZZ) underbody shields and Heavy-Duty front-springs, LTZ PLUS PACKAGE for Crew Cab and Double Cab, includes (JF4) power adjustable pedals, (UQA) Bose premium audio system and (UD5) Front and Rear Park Assist., DURAMAX PLUS PACKAGE includes (LML) Duramax 6.6L Turbo Diesel V8 engine, (MW7) Allison 1000 6-speed automatic transmission, (GT4) 3.73 rear axle ratio, (K05) engine block heater, (K40) exhaust brake and (IO6) Chevrolet MyLink 8 Diagonal Color Touch audio system with Navigation Includes (PDF) LTZ Plus Package. , TRANSMISSION, ALLISON 1000 6-SPEED AUTOMATIC, ELECTRONICALLY CONTROLLED with overdrive, electronic engine grade braking and tow/haul mode, TRAILERING WIRING PROVISIONS, FOR CAMPER, FIFTH WHEEL AND GOOSENECK TRAILER includes additional 7-way wiring harness is located at the rear of the pickup box attached to the rear frame cross member, TRAILER BRAKE CONTROLLER, INTEGRATED, TIRES, LT265/60R20E ALL-TERRAIN, BLACKWALL, STEERING WHEEL, HEATED, LEATHER WRAPPED WITH AUDIO AND CRUISE CONTROLS, SEATS, FRONT FULL-FEATURE LEATHER-APPOINTED BUCKET with (KA1) heated seat cushions and seat backs. 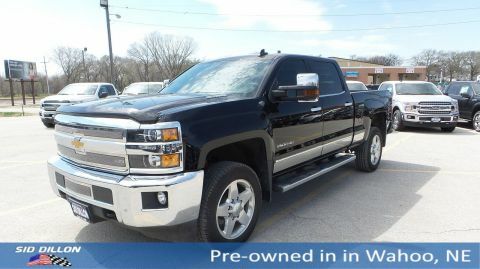 Includes 10-way power driver and front passenger seat adjusters, including 2-way power lumbar control, 2-position driver memory, adjustable head restraints, (D07) floor console, storage pockets and (K4C) wireless charging., SEATING, HEATED AND VENTED PERFORATED LEATHER-APPOINTED FRONT BUCKET.